Today’s blog is a departure from science and an extension of my discussions about film. 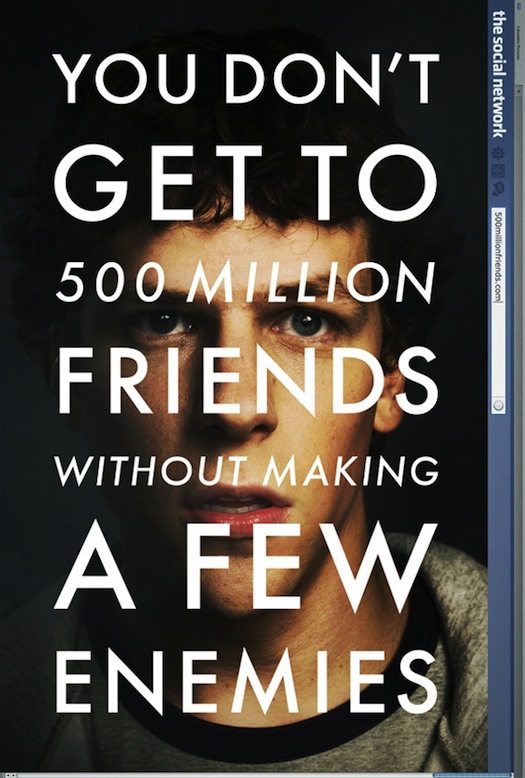 This weekend I saw the Sorkin-Fincher venture The Social Network, the story of the creation of Facebook. After hearing a wildly enthusiastic thumbs up on NPR I expected fireworks. And while the film is better than most—especially the crackling script—it takes some cheap shortcuts and is stingy on subtlety. On the plus side, Aaron Sorkin writes some of the best dialog this side of David Mamet. Sorkin, who created one of the best (and neglected) TV shows of 2006, Studio 60 on the Sunset Strip, writes like a modern incarnation of Clifford Odets (The Sweet Smell of Success): all poetry and punch. The film’ story is delivered by Jesse Eisenberg, a darling of the indy world (The Squid and the Whale, Adventureland), and sails on his fluid ability to inhabit the psyche of Mark Zuckerberg, the lad who co-founded Facebook with three other students, including Eduardo Saverin. Andrew Garfield plays Saverin, whose electric presence overshadows Eisenberg. (To get a full complement of Garfield’s talents, rent the first dvd in the British trilogy called Red Riding: The Year of our Lord 1974, a gritty series about police corruption in Northern England). But the more minor performances are presented with little subtlety, including a turn of Napster founder Sean Parker by Justin Timberlake in overzealous mode. Most of the women—with the exception of Zuckerberg’s girlfriend—are partying tarts and dimwitted potheads. Fincher, whose music videos deserve acclaim, heightened his prowess with Fight Club. References to Ikea and Starbucks helped propel the movie, but in The Social Network, Mark Zuckerberg is filmed in a long series of shots wearing a hoodie with GAP clearly labeled on his chest and the shell in the crew race is emblazoned with ads. And every time a laptop pops open we see the brand. Fincher also resorts to some pretty cheap theatrics by digitally inserting steamy vapor arising from the actors’ mouths during the wintry outdoor scenes, and the role of the twins Tyler and Cameron Winkelvoss is played by one actor, whose face is copied and pasted onto another actor’s body. I suppose the film is more about relationships, and reveals the irony that the driving force behind a revolutionary reinvisioning of community—Facebook–is a socially inept geek. This entry was posted in authenticity, cinema, film, social media. Bookmark the permalink.